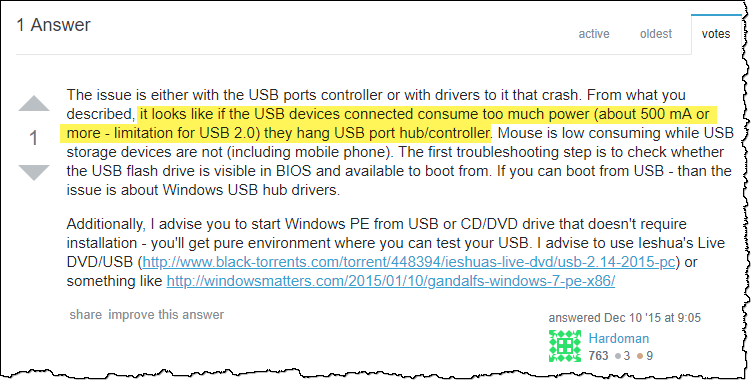 Proud Programmers Blog :: Ahhh, of course I should know that "An unspecified error occurred (696e647863686b2e 9cb)" actually means "hey, your USB disk is drawing too much power from the USB-port"! Whaaaat! Could unbelievably be lack of USB power?!?! Yupp, my USB Docking station (remember, the ICY BOX 2bay HDD station) was connected to this docking station. Connecting it directly to the laptop, and away went all problems with stuck Windows as soon as I connected the USB drive! 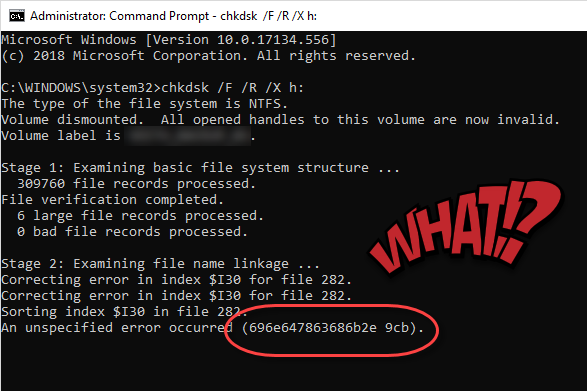 I could run the CHKDSK without unspecified errors! Have you plugged your iPhone charger cable into the dock? Don’t expect that to work when you power up the machine first thing in the morning! No, you have to manually reinsert the USB cable into the dock to “enable” it again. Forget this – and you might end up with a flat iPhone-battery because you though you were charging it?! Haha, bummer! Using Display Port for your external monitor? Haha, you have to reinsert that too almost every time you connect to the dock! It turns out that it only support a VERY small number of monitors and resolutions. Start reading about the dock on the net, and you’ll find loads of similar experiences. The correct price-range for this dock is approximately $10 …. What about the content of the BitLocker-drive? What would you guess? OF COURSE it was corrupted! And there ends my tour with BitLocker. Yes, the main drive on the computer is still BitLocker-controlled, as this is the company policy. But for other uses – good bye! But – I still want to protect my USB drive, so now what? In the previous article I mentioned that VeraCrypt and StorageCrypt could be alternatives. I went for a commercial alternative – BestCrypt from Jetico. Haha, somethings never change I guess. Encryption does take time. 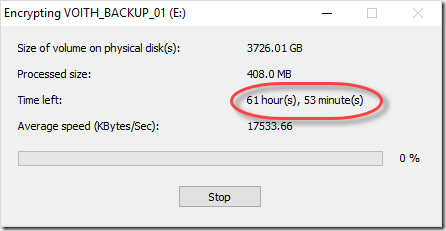 But remember – after 72 hours, BitLocker were only halfway through. I guess BestCrypt perhaps is somewhat faster. I’ll be back with a report on BestCrypt by the way.